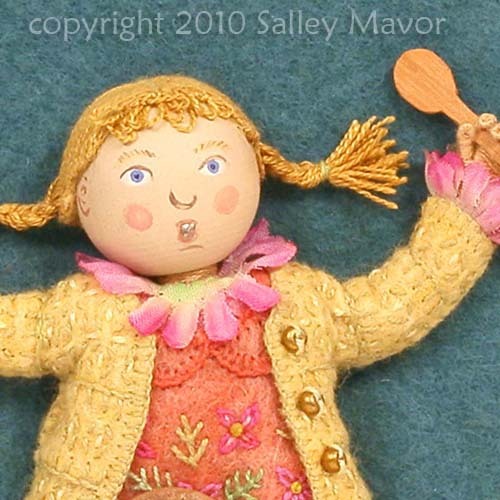 One of the fun and challenging parts about illustrating for children is showing emotion and action, especially in fiber art, which tends to be static. To counter-act the stiff blandness, I like to bring forth emotion by exaggerating the poses and facial expressions of my characters. But there’s a fine line between evoking believable feeling and creating a grotesque appearance, much like the difference between acting well and over acting. 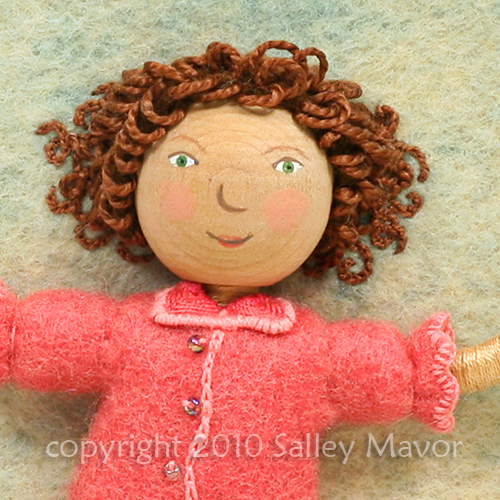 I’ve seen some doll faces that are downright scary and bizarre. My goal is to portray emotion with a subtle firmness, without being too disturbing. Nursery Rhymes are full of emotional and physical activity, so I had lots of opportunities to experiment with poses and facial expressions in my book, Pocketful of Posies: A Treasury of Nursery Rhymes. Here are a selection of close-ups from the book. 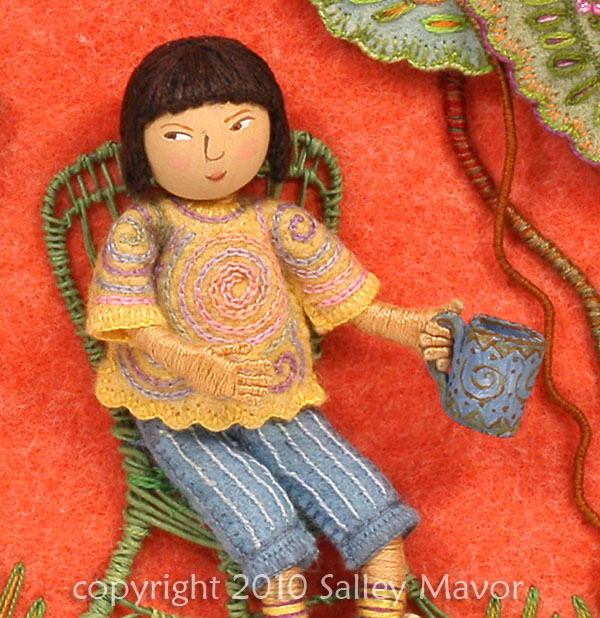 Do you want to see the original embroidered illustrations from the book? There are still several locations scheduled for the Pocketful of Posies Traveling Exhibit, which has been touring the country since 2010. 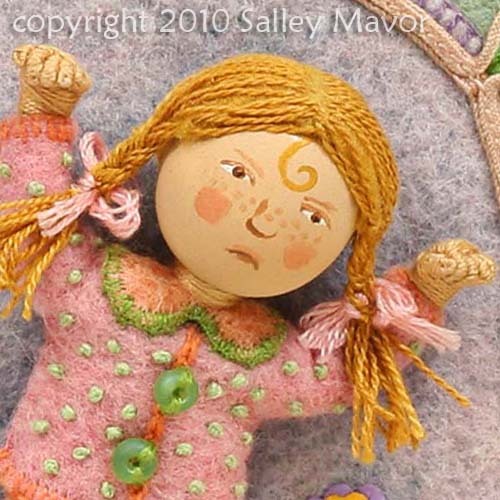 This entry was posted in Children's Books, Closeups, Embroidery, Fabric Relief, Felt, illustration by Salley Mavor. Bookmark the permalink. So nice to see these sweet faces up close! you do this so beautifully…the details are just enchanting. thank you for always sharing your work with us. when you post the detail shots like this it makes me all the more aware of all the little things i don’t see when looking at the work as a whole. Salley, I am Always in Awe of your Art and Talent.. Again a Thousand Thanks for always sharing your life and work. 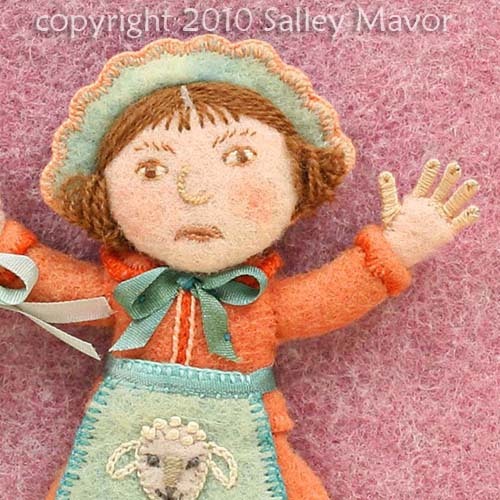 some wonderful expressions you have caught here, popped over to the link and so glad I did. Would love top see the exhibition, maybe it will be brought over to the UK one day and I will have togo. I would love to send my work over to the UK! All it would take is an invitation and funding for shipping costs. Your little people are such a joy! It truly is difficult to make faces say what you wish to say. You do it well,Salley! I particularly love the little sly Miss with the teacup!